Calls to other Skype users will be free, and international calls will use Skype's low per-minute rates. A data plan is required, which seems fair enough, but the calls won't accrue any voice minutes. About to have a long talk with a friend on another network? Ask that person to call you on Skype instead, and save minutes. Verizon and Skype haven't said whether you'll be able to purchase cheap minutes for calls within the United States. I'm assuming it won't happen, because that feature would allow you to choose a cheap voice plan with Verizon while avoiding overage charges on talk-heavy months. Verizon will use its voice network to handle Skype calls, meaning you won't have to worry whether your 3G connection is up to the task. This also takes undue strain off Verizon's data network, putting calls back on voice where they belong. Don't expect a full-featured version of Skype on your Verizon phone, as the ability to make conference calls or have a video chat aren't included. Skype chief executive Josh Silverman told PC Magazine that Skype is working on those features, but there's no indication that they'll be enabled any time soon. Skype will run in the background on Verizon phones, so you'll be able to receive calls any time. If you've got a friend or family member who's using Skype at home, that person can use Skype to reach you without making sure you've got Skype fired up on your end. 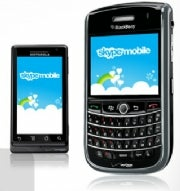 Skype Mobile will debut on BlackBerry's Storm, Storm 2, Curve 8330, Curve 8530, 8830 World Edition and the Tour 9630; Motorola's Droid and Desire; and the HTC Droid Eris.